In the late 1970s and early 1980s, my big brother Scott and I nursed ourselves on a steady dose of afterschool reruns of Star Trek episodes. We also loved the original Battlestar Galactica series. Anything in space, really. On rainy Oregon afternoons, which accounted for most Oregon afternoons, Scott and I would reenact scenes from those shows and even make up scenarios. But there were rules. Scott always got to play the character in charge. As the kid brother, I never got to be Apollo from Battlestar; I had to be Starbuck. Scott always got to play Captain Kirk, then he would assign me to play another Enterprise crew member. One of my favorite places to visit as a kid was the Oregon Museum of Science and Industry (OMSI). I never had any aptitude for science, but I had a great love for science fiction and space. 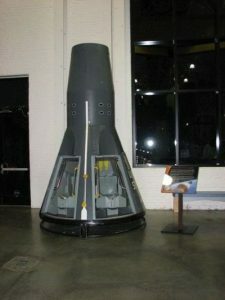 Among the many cool things about OMSI was that it housed—and still houses—a full-size replica of the Gemini spacecraft capsule. The replica was originally won by a sweepstakes contestant in the 1960s who turned around and donated it to the museum. Whenever we visited OMSI, Scott and I would stand in line with all the other kids to take turns sitting inside the two-seat capsule. 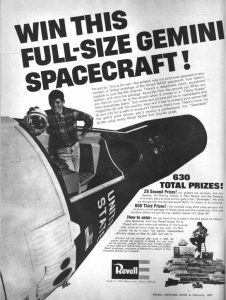 I look at pictures of the capsule now and it seems so much smaller than I remember. But what I remember most is that when Scott and I were sitting together in the capsule there was no playtime character portrayal hierarchy. I wasn’t playing a spaceman from TV. After fiddling with all of the nobs and buttons inside the capsule, I would close my eyes shut tight so that everything went dark. And in that moment, I wanted to believe that I really was in space. Read more by Eric Wasserman at www.ericwasserman.com.